The North Korean government continued to use forced labour in prison camps and labour training centres and even encouraged forced labours of students and exported forced labour to foreign organisations. The US State Department on June 28, 2018 categorised North Korea as the "worst human trafficking country" for the 16th straight year in its annual '2018 Trafficking in Persons Report'. North Korea has been named in the lowest ranked Tier 3 category along with China, Russia and Iran. However, South Korea has been ranked at the highest category in the list of Tier 1 countries for the 16th consecutive year along with the US, UK, France and Canada. What led categorisation of North Korea as the worst human trafficking country? • North Korea used state-sponsored forced labour to fund government functions as well as other illicit activities. • The North Korean government continued to use forced labour in prison camps and labour training centres and even encouraged forced labours of students and exported forced labour to foreign organisations. • It does not fully meet the minimum standards for the elimination of trafficking and is not making significant efforts to do so. • It did not monitor or protect potential trafficking victims when they were forcibly sent back from China or other countries. The report came in the backdrop of growing displomatic talks between South Korea and the US. Both the sides have been negotiating North Korea's dismantling of its nuclear weapon programme. The negotiations came after the historic meet between US President Donald Trump and North Korean leader Kim Jong-un in Singapore. 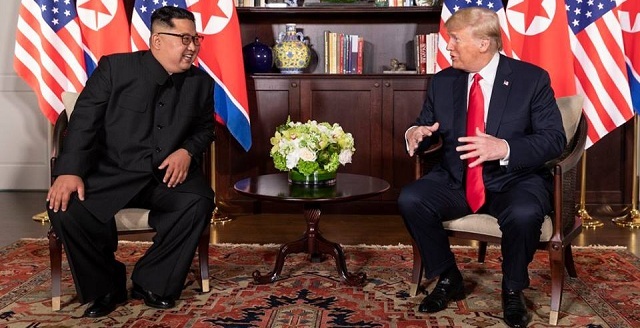 The two leaders signed a joint agreement, wherein Kim agreed to work for a 'complete denuclearisation of the Korean Peninsula' in exchange for security guarantees by the US. Moreover, recently, the United Nations Security Council (UNSC) passed a resolution, wherein it banned other countries from issuing new work permits to North Korean workers. The council also directed the governments of those countries to expel the workers before the end of 2019. The '2018 Trafficking in Persons Report' placed India in Tier 2 category for making significant effort to comply with the US standards. However, India does not fully meet the minimum standards for the elimination of trafficking. The report urged India to increase prosecutions and convictions for all forms of trafficking, including forced and bonded labour and to prosecute officials allegedly complicit in it. What does Tier 1, Tier 2 and Tier 3 categories imply? • The US Department of State places each country in the Trafficking in Persons Report into four tiers, as mandated by The Trafficking Victims Protection Act of 2000 of the US. • Tier 3 ranking is for countries that fail to fully comply with the minimum US standards and are not making significant efforts to do so. A Tier 3 ranking can trigger American sanctions, limiting access to US and international foreign assistance.